The Enduro incorporates all the latest technologies, from the ISO magnetic stripe encoding option to Magicard’s renowned patented visual security features, the HoloKote anti-counterfeiting watermark available in 4 standard designs. The Magicard Enduro is upgradable printer for plastic cards. 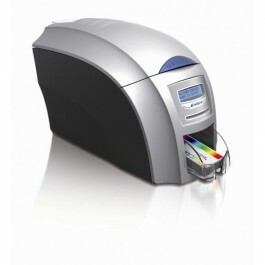 The Magicard Enduro can be field-upgraded from single to double-sided ID card printing, with a simple drop-in upgrade. The Enduro Duo is double-sided out of the box. A 100-card feeder at the rear and a hand-feed card slot at the front provide users with both batch-printing and one-off card printing convenience. The user has the option to print a HoloKote® security watermark across the card surface. security seal. A choice of 4 fixed HoloKote patterns are selectable from the printer driver. Operation Enviroment Sheltered office environment 10°C - 30°C (50°F - 85°F).